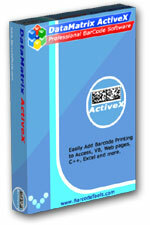 Easily Add DataMatrix Barcode Printing to Access, VB, Web pages, C++, Excel and more. The DataMatrix-ActiveX Control has all the features necessary to easily add professional quality barcodes to any Windows application including Web pages, database reporting and labeling, product packaging, document tracking, postal bar coding and special purpose barcode labeling applications. Simply insert the DataMatrix Bar Code ActiveX Control into your application and specify a few properties in the properties window and your desired bar codes will be generated automatically. You can use our DataMatrix ActiveX Controls in any application or programming environment that supports ActiveX Controls including Microsoft® Access, Excel, Word, Visual C++, C#, Visual Basic, Visual FoxPro, Visual Studio.NET, Borland Delphi, C++ Builder and more. DataMatrix ActiveX Control supports ECC-200 error correction. ECC200 is the newest and most standard version of data matrix error correction. It supports advanced encoding and error checking with Reed Solomon error correction algorithms. These algorithms allow the recognition of barcodes that are up to 60% damaged. The DataMatrix-ActiveX Control supports data binding so you can bind fields in a database to the Control and generate barcodes for each data record automatically. The data binding capability makes it trivially easy to produce reports and labels containing bar codes using any database that supports ActiveX technology including Microsoft Access or Visual Basic. Developers intending to distribute our control with their applications will be glad to know that all functionality of each barcode control is implemented in a single, small file. Distribution of our products outside you organization requires a Developer License. DataMatrix-ActiveX can be used as ASP server component for IIS to create barcodes dynamically on the server. A barcode will be created inside a HTML file by using a simple IMG tag. The barcode will be created on the server as PNG, JPG, GIF, TIFF or BMP image and sent to the browser. No temporary files will be created on the server and the client does not need any plug in's. A great solution to create barcodes in an Internet or Intranet project. You can generate barcodes on the client side. To do it, you should install DataMatrix-ActiveX on this computer (a Single User License is required), after that you can create barcodes in IE. Our control was created in Visual C++ using ATL, the file size of the controls is very small (which makes them easy to distribute), they use less CPU cycles than other controls and give greater performance. The DataMatrix Barcode ActiveX Control allows you to save bar codes to disk in all major graphics file formats including GIF, PNG, JPEG, TIFF, BMP, EMF, WMF. The GIF, PNG and JPEG capabilities allow the control to be used as a bar code graphic engine on a web server. Settings are provided for the foreground and background colors, data, orientation, etc. Our DataMatrix-ActiveX was tested using Microsoft Web Application Stress Tool. During out tests, we emulated simultaneous access of 1000 clients for 48 hours. The test revealed no memory leaks at all together with a high RPS rate (requests per second). Copyright (c) 1999-2013, VBC Software. All rights reserved.